Ellen is left, husband is on the right. Louis Neil was allegedly a passenger on "Flight 175", one of the planes suppposedly hijacked on 911. Now the wife has lost her battle in the US Supreme Court. Imagine that. A poor woman losing in the Supreme court and not getting justice. I strongly recommend the wife of Louis Neil Mariani to explain her case here at Cluesforum. Here Ellen explains what happened to her at Chicago (!) when she was told that her husband was on the fatal flight. Does she sound right? Last edited by Heiwa on Wed Feb 20, 2013 5:06 pm, edited 3 times in total. They all got "Justice" in the shape of many years of Supreme Court Judges fees, Attorneys fees, Clerks fees, Typists fees, Stenographer fees, etc etc. All of which comes from the tax-payer. Redistribution of wealth upwards, which is what "nineeleven" was all about! So now she's lost her last appeal to the Supreme Court? How sad. I wonder where the $11.000 donation monies went. Ellen Mariani, whose husband died on 9/11, will have her request for an appeal to the U.S. Supreme Court considered after all. A fundraising effort was launched in September to raise the $11,000 needed to file the application to appeal – and the effort has succeeded. And yes, I officially invite Mrs Mariani to Cluesforum to explain her case - and to take advantage of our special 9/11 expertise. She should find it interesting to find out that there are no official records confirming the very existence of "FLIGHT 175" or its alleged passengers. 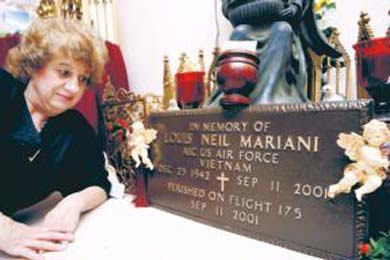 Allright folks, so today I took a closer look at Ellen Mariani's alleged husband "Louis Mariani" (who supposedly perished in "FLIGHT 175"). "In the port of Montevideo, 60.000 fans have made the trip to see him disembark from the transatlantic ship which brought him there. 100.000 people attend his concert in the Uruguyan capital. The Beatles, who are also touring the country, just cannot believe it. Here, they are not the top stars - Mariano is." Once again, it is up for anyone to judge whether this face-and-name likeness is just a haphazard coincidence or not. Interestingly, one of Luis Mariano's top hits was called "Les Chevaliers du Ciel" ("the Knights/riders of the sky"). ps: I think it should be crystal clear to everyone, at this stage, why the 9/11 perps felt the need to come up with a kooky character such as Ed Chiarini (aka "Dallas Goldbug"): that clown's core agenda is obviously to discredit and ridicule the art of photo analysis - and specifically any comparisons between two given persons / entities. I trust discerning minds will able to see through the crass "Golbug-tactics". To make myself very clear: am I saying that Ellen Mariani is an actress - just like Bob McIlvaine and Donna Marsh O'Connor - as expounded in my video (released back in March 4, 2010) "911ACTORS"? This scam must stop. The game is over. Figure that: the one-and-only alleged "9/11 family member" purportedly fighting for justice (to this day) has been busted. Ellen Mariani was a fraud all along - and her alleged husband "Louis" was just as 'real' as Ellen's countless, bogus & doomed-from-the-start lawsuits filed by phony attorneys - the likes of Phil Berg and Ray D. Kohlman. What a joke. Oh, and btw: There is no "Louis N. Mariani" listed in the SSDI or in any US death records as deceased on September 11, 2001. 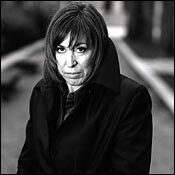 ELLEN MARIANI HARASSED BY "THE EVIL CONSPIRACY THEORISTS"
"9/11 SKEPTICS' LUNATIC FRINGE TARGETS VICTIM'S WIDOW"
What a pathetic dog and pony show that was ! Hitler; they met while both were serving in the Israeli army during the 1948 war." Our 'veteran' TV fakery researchers will remember Rick Siegel: he ran the now long-defunct "911researchers" forum which was, in fact, the very first internet forum I ever contributed to. It didn't take long before Rick Siegel betrayed his true colors...and simply shut down the place! In fact, the very same thing happened with the second forum which I frequented ("911movement.org"). Just as Hoi Polloi and I started bringing up the VICSIM issue, that forum suddenly closed down too! Well, let me tell you all: this forum will NEVER close down as long as I live. Evidently the term "Hate speech" does not apply when if it is used to describe anyone who has opinions outside the mainstream (even if they are shills). Every generation of mankind has been amused, directed, frightened, placated, angered, confused, and controlled by myths resulting from authoritatively oft-repeated narratives. How anyone with a sense of humor fails to laugh at 9/11 and made-for-television “shoot-em ups”, is beyond me. Inside jokes are deliberately made for any show’s more perceptive audience. "The Olympians were ‘the happy gods,’ ‘the deathless gods’, far removed from suffering mortals destined to die. But in their grief and at the hour of death, men could turn for compassion to the goddess who sorrowed and the goddess who died." Ancient gods were dethroned and deceased, cast forth, wiped out in a day , as Swinburne poetically wrote. Following Constantine’s making Christianity the official religion of his empire new narratives and myths controlled the masses. Wafers and wine at any authoritarian altar magically trans-substantiated into human flesh and blood in order to enable believers, terrorized by demons and damnation, to eat their dead deity. Just as with the Olympian gods, it seems to us incredible that humans fell for such myth and narrative. The same holds true for the official 9/11 narrative. Take Ellen Mariani for example. Those following the 9/11 show will recall her as actress-wife of simulated victim (vicsim, or datafake) Louis Mariani. The role of husband Louis was to become vaporized when riding inside a digitally animated airplane as it melded into a NY skyscraper. Ellen’s 9/11 show role is to play a grieving and angered widow who, on behalf of herself and other “survivors”, unsuccessfully demands justice all the way to the Supreme Court, for those who did what? Created a 102 minute movie shown on TV networks as breaking news? No. Her role involves interfacing with politicians. Apparently, 9/11 was not just a comedy but also a reality show! 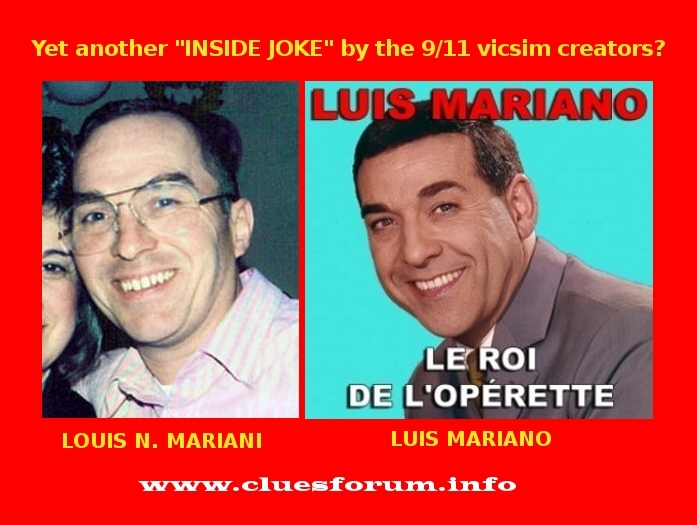 One hearty laugh from the audience of our 9/11 comedy show’s perceptive members comes from the humor of poor dead “Louis Mariani”. We repeatedly discover that the 9/11 show’s writers seeded their comedy with inside jokes, a series of which involves using photos of celebrities for those of fake 9/11 victims. How they must have laughed as they named newly created datafakes, inventing names garbled from those whose images they used! We all know of the phony heroic tower EMC, Yamel Jager Merino with facial traits “borrowed” from a young Bianca Jagger. The indefatigable Simon Shack has recently discovered Luis Mariano, an immensely popular operetta singer of the recent past, and more recent namesake of Ellen’s poor dead “husband Louis Mariani”. For Mr. Shack’s discovery, see http://tinyurl.com/911mariani . In the modern world narratives must be created to persuade young men of separate countries to enter wars against one another. A brilliantly devised political-economic system, combined with advertising and role-modelling, raised our nation’s inhabitants within a century from struggling agrarian existences to those of the booming 1960′s, 70′s, 80′s. and early 90′s. This system, which enriched its bankers, is finally unsustainable both financially and environmentally. New myths and narratives, creating new realities, will determine mankind’s direction along with the future of those Aldous Huxley termed “Guardians” in his Brave New World. Myths of 9/11, inside jokes notwithstanding, may forever be believed by the masses. Only the future may determine whether or not such beliefs, as those of the past, worked to the advantage or to the disadvantage of our species. That Luis Mariano was a great find, it's the icing on the cake when a site like 'Veterans for Today' picks up on it, I love it when you can link to the research on this forum via a more acceptable (for unbelievers) main stream site. Thanks Stewart Ogilby. antipodean wrote: That Luis Mariano was a great find, it's the icing on the cake when a site like 'Veterans for Today' picks up on it, I love it when you can link to the research on this forum via a more acceptable (for unbelievers) main stream site. Thanks Stewart Ogilby. If there are real relatives of the "victims", why don't they speak up and acknowledge having doubts about the official story and demand to know what happened to their family members? Some believe that Ellen Mariani, widow of an alleged passenger on Flight 175, did just that by filing a lawsuit against the United States government and some of its representatives. She is apparently the only relative to sue in such a manner. By doing so, and give up the money offered by the government to relatives, she certainly stands out. The relatives’ families have had the opportunity to act like families of people who have lost someone. Typically, if there is any shred of doubt as to what happened, the relatives of victims press to find out the truth. They read up on the subject and would surely know by now the crash scenes were faked. They are the best evidence that there were no true passengers on 9/11. That's an interesting article, Dean - but don't you think it is overly complex for the average reader? 1: There were no hijacked passenger airliners on 9/11 - and therefore, no victims from those fictitious flights. 2. The alleged "family members" of the purported 9/11 victims (in planes or skyscrapers) are all actors. Ellen Mariani is but one of these actors - and her alleged husband "killed in Flight 175" has been exposed as a fraudulent entity constructed using the facial traits AND name/surname of an operette celebrity of the fifties. You may wish to peruse it - in order to get a feel of what our stance on Fetzer is. The article and others point out how difficult it is to get the message across that there were no victims. What I have done in my writings is to show the reader how we became fooled into believing there were passengers. My discussions with Jim Fetzer and others have all been a part of the learning process. He invited me to speak at the Vancouver Hearings last June. Even there the concept of no passenger victims was a tough sell. I believe that many people have a mental block on this because of (a) their belief in what they see or think they see on TV and/or (b) stereotyping the plotters as homicidal maniacs. Dean, I'm just a bit confused, why would you be "stereotyping the plotters as homicidal maniacs" if there were no passengers ? You appear to believe in the flights landing at Cleveland scenario, is this where you think some people were disposed of ? Also if people (plane huggers) believe in the Controlled Demolition of the towers whilst there were thousands of occupants, why is there a problem in "stereotyping the plotters as homicidal maniacs" ? Edit : my bad just re read what Dean wrote, he obviously mean's the average truther perceive's the plotters as being homicidal maniacs. But still interested in the "planes landing in Cleveland" scenario. Based on Bureau of Transportation Statistics that show 175 flew, ACARS information (email/GPS) that indicates the flight was over the Midwest several minutes after its supposed crash at WTC2 and several news reports telling of approximately 200 "passengers" otherwise unexplained in Cleveland, I believe people got off 175 in Cleveland. They went to the evacuated NASA building where I believe they acted as agents of the plot. They were not killed.